There are many periods when a certain Metal genre was in great evidence. At the end of the 70s, NWOBHM came and changed many features on traditional Heavy Metal. In the first half of the 80s, there was a burning cauldron that gave birth to Death Metal, Thrash Metal and Black Metal, and on the second half of this same decade, Thrash Metal became more evident, while the others went into the depths of underground. On the beginning of the 90s, Death Metal was the next in line, when Thrash Metal seemed to be dying of exhaustion (due the great number of bands). The murdering of Euronymous in Norway on 08/1993 was the factor that turned Black Metal the most prominent Metal genre on the second half of the 90s, along with the first bands from what we call Melodic/Symphonic Power Metal. So to be in love with these formats of Metal is not a crime at all, but if you’re thinking to start a band and to emulate those formats, I must tell you an important thing: do it in your way, not on others way, to build something different. 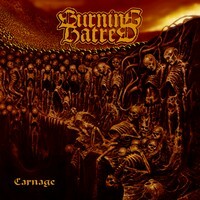 The Dutch quintet BURNING HATRED shows a good work on their first album, called “Carnage”, but they could be better. They play in a format that reminds a lot that same from bands from the First Wave of Swedish and Dutch Death Metal. Names as DISMEMBER, GOD DETHRONED and SINISTER come easily to our minds, but they still have to mature a lot their musical insight, because they are too near of their influences, not escaping from their shadows. They have a musical identity, but it is oppressed by the need to sound as the ancients sound. This is a feature that in a musical world as competitive as Metal in these days we are living is a mortal sin. When the album starts to play, we can hear clearly that the sound quality is very good. Besides the band’s Old School style of playing, with those raw and nasty tunes that were used by the ancients on the beginning of the 90s, they use a sonority that allows us all to understand what they are playing. It’s a difference between all those bands that try to be a “90’s Death Metal band”. Unleashing their fury on 10 songs, it’s easy to understand that they have a good talent to the style, but must run away from their influences. The harsh atmosphere with noisy riffs from “The Rawagede Massacre”, the funereal slow parts of “Reign of Horror” and “Carnage of War”, the very good work from bass guitar and drums on “Religious Insanity”, and the good vocals that are presented on “Doomed City” are proofs that they have a great musical potential on the genre, but they must work to overcome their musical influences’ strength. It’s a good work, but could be better.